1. Hexaflexagons; 2. Magic with a matrix; 3. Nine problems; 4. Ticktacktoe; 5. 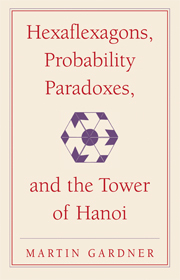 Probability paradoxes; 6. The icosian game and the Tower of Hanoi; 7. Curious topological models; 8. The game of hex; 9. Sam Loyd: America's greatest puzzlist; 10. Mathematical card tricks; 11. Memorizing numbers; 12. Nine more problems; 13. Polyominoes; 14. Fallacies; 15. Nim and tac tix; 16. Left or right.